Photograph of Anne Brown with elementary school students in Sayama, Japan is a picture, with genre photograph and group portraits. It was created on Friday, October 16, 2009. 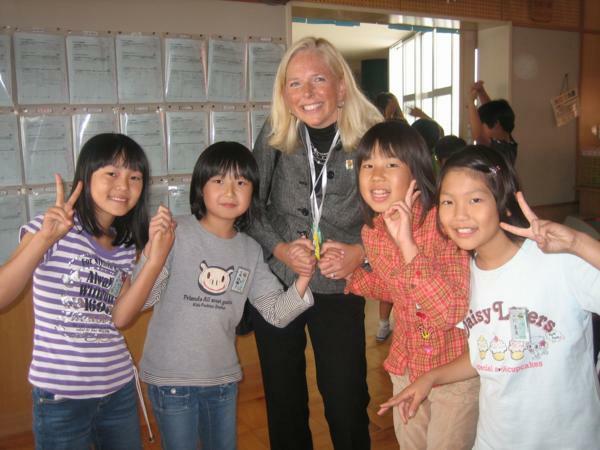 City of Worthington Communications Director Anne Brown is shown here with four students at the Irumagawa Elementary School in Sayama, Japan. Anne was one of the members of Worthington’s 2009 mayoral delegation to Sayama. This delegation spent time at the Irumagawa Elementary School, located near the center of Sayama, observing classrooms and meeting with students. It covers the topics Sayama-shi, Japan, students, teachers and elementary schools. The Worthington Libraries identification code is wcd0188. This metadata record was human prepared by Worthington Libraries on June 13, 2017. It was last updated November 30, 2017.